Want to guess which DC Metro stations the most riders walk to? Your best bet is to count apartment buildings nearby. 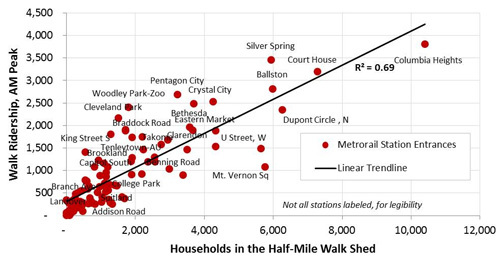 All in all, Metro’s stations fit neatly along a trendline that shows a strong correlation between more households nearby and more riders arriving to stations by foot. Even the outliers tell a story. U Street and Mount Vernon Square have the 6th and 7th highest number of households nearby, but they under perform on walking Metro ridership. One might speculate that Mount Vernon Square is so close to so many offices that more people simply walk. U Street is a little farther away, but it’s still close enough to downtown that buses and bicycles may be better options for a large portion of riders. One factoid that may in fact surprise is that three of the five most-walked-to stations are not in DC: Two of those stations are in Arlington (Court House and Ballston) and one is in Silver Spring, Maryland. Elsewhere on the Network today: PubliCola reports that Seattle has struck a compromise on micro-housing. And Urban Review STL runs the numbers to see what Missouri would be collecting from its state gas tax if it had kept pace with the level of revenue in 1996.